How often does something unexpected pop up in your everyday life? A soccer game runs late, there’s an appointment you’ve forgotten about, there’s a sudden meeting, or the car breaks down – these are all parts of everyday life that can really throw a wrench in feeding your family at the end of the day. 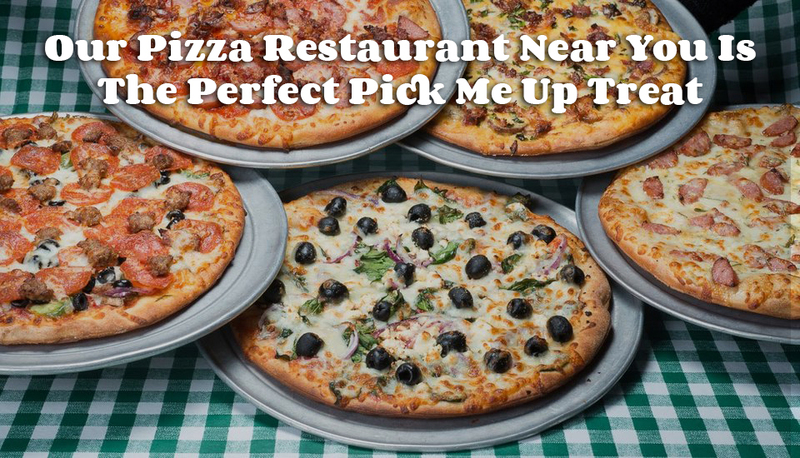 At Bucceto’s, our pizza restaurant near you is the perfect pick me up treat that takes care of you and your family even when the unexpected makes its way into your life. With our pizza restaurant near you, you have the option of dining in, picking up, or having your dinner delivered right to your door. Throwing a party on short notice? Simply call our catering with 24 hours advanced notice, and we’ll take care of your guests for you! Bucceto’s and our owner Paul Heilbrunn know how important it is that the whole family can find something to love all at once location, and for this reason, we have a vast gluten free menu that includes every course of a full Italian meal. From your appetizers, to your soup and salad, to sandwiches, entrees, pizza, pasta, and dessert, you can indulge without worry and with plenty of fresh flavor. Our gluten free pizzas are made using rice flour and can be prepared custom to your liking with a selection of 40+ gluten free ingredients, or you can choose a unique take on pizza with our Smiling Teeth combos. Our pizza restaurant near you doesn’t just come through for dinner, we make your lunch simple as well. With locations in Bloomington and Columbus, you always have a favorite lunch spot where you can get fresh and friendly eats no matter who you’re having lunch with. 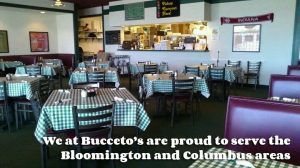 We at Bucceto’s are proud to serve the Bloomington and Columbus areas, and we show that pride through our varied menu, fresh ingredients, vegetarian options, gluten free dishes, and our customer first service. The next time you’re in the mood for one of the best Italian restaurants in Indiana, we’re happy to be the pizza restaurant near you!